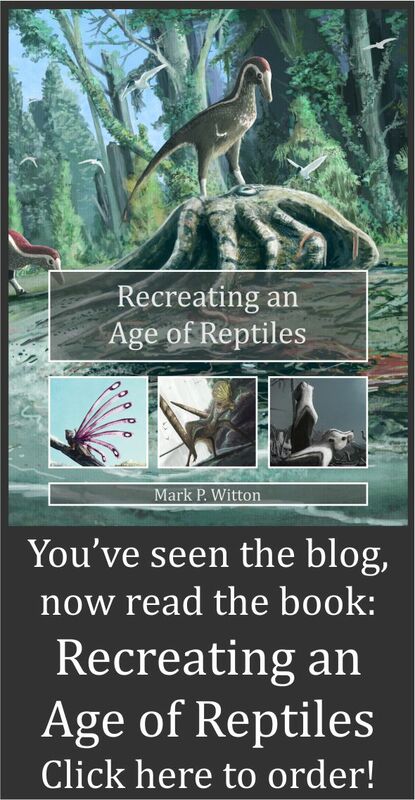 Mark Witton.com Blog: 'Thalassodromeus sebesensis': pterosaur out of time and space? Nope, just a misidentified chunk of turtle. 'Thalassodromeus sebesensis': pterosaur out of time and space? Nope, just a misidentified chunk of turtle. Today sees the publication of an article challenging an exciting claim made in recent pterosaurology (Grellet-Tinner and Codrea 2014). If you missed it, the article concerned identifies a thalassodromid pterosaur in uppermost Cretaceous rocks of Romania and the erects a new species, Thalassodromeus sebesensis Grellet-Tinner and Codrea, 2014. At the centre of this is ODA-28, an (alleged) fragmentary cranial crest only fully exposed on one surface. None of this may not sound like a big deal, except that other thalassodromids - including the alleged sister species, Thalassodromeus sethi - are only known from the Lower Cretaceous Araripe Group of Brazil. T. sebesensis thus is about 40 million years out of time and thousands of miles out of place, and also occurring when azhdarchid pterosaurs basically represent the entire diversity of Pterosauria (Grellet-Tinner and Codrea 2014). Suddenly, the routine act of naming of a new animal is rewriting our understanding of pterosaur evolution. There's more. Despite having only a scraps of bone to work with, Grellet-Tinner and Codrea (2014) suggested the T. sebesensis crest anchored muscles to form a ‘sizeable fleshy crest’, acted as a rudder in flight, that it somehow highlighted co-evolution between Romanian pterosaurs and angiosperms, and ecological segregation between azhdarchids and thalassodromids. All of these ideas are pretty radical in one way or another, especially considering the fossil material they are based on. Blah blah blah… extraordinary claims, extraordinary evidence etc. When T. sebesensis was published it raised the collective eyebrows of pterosaur workers for all the wrong reasons. ODA-28 has no obvious ties to Thalassodromidae (or Thalassodrominae, if that’s how you roll - see Witton 2009), Pterosauria, or even to a cranial crest. Today, I and 19(!) other authors have said this in print (Dyke et al. 2014), noting that ODA-28 lacks any pterosaurian synapomorphies or even features typical of the group. As anyone who has handled pterosaur fossils can attest, pterosaur remains are distinctive at gross and microscopic level, and ODA-28 lacks any features expected in pterosaur bone (e.g. extremely thin bone walls separated by trabeculae). Any resemblance to the Thalassodromeus sethi holotype is entirely superficial, and shared characters between the two specimens - notably the ‘fossae’ at the base of the ‘T. sebesensis’ crest - are really incomparable on detailed examination. A clear lack of symmetry in ODA-28 shows it is not a medial skeletal element either, and thus not the cranial crest of anything. In short, cancel the text-book revisions: the temporal and palaeobiogeographical anomaly of ‘Thalassodromeus sebesensis’ is just a fairly major misidentification of a scrappy fossil (Dyke et al. 2014). The 'flying turtle': the holotype of 'T. sebesensis' compared with the plastron of the turtle Kallokibotion. A, NHMUK R4930, the lectotype plastron of Kallokibotion magnificum with the portion corresponding to ODA-28 outlined in black (photo supplied by S. Chapman, Natural History Museum, London); B) ODA-28 (modified from Grellet-Tinner and Codrea, 2014). Abbreviations: hypo, hypoplastron; hxc, hypoplastron-xiphiplastron suture; ihc, intra-hypoplastral suture; ib, inguinal buttress; ps, pubic scar; meso, mesoplastron; mhc, meso-hypoplastral contact; pll, posterolateral lip; xiphi, xiphiplastron. Scale bar for A equals 50 mm. From Dyke et al. (2014). Is ODA-28 anything exciting at all? Well, not especially. 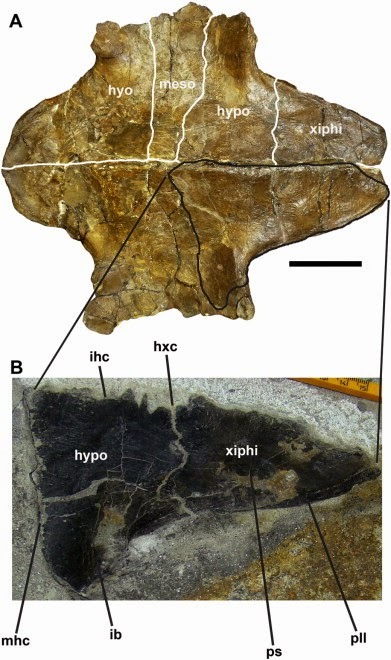 The specimen is clearly a piece of turtle plastron, exactly matching the internal structure of the hypoplastron and xiphiplastron of the Maastrichtian, Romanian genus Kallokibotion (above, Dyke et al. 2014). The anatomy of Kallokibotion has been documented fairly thoroughly and known for about 100 years (e.g. Gaffney and Maylan 1992), allowing us to be confident in this identification. Ergo, 'T. sebesensis’ offers nothing other than new a piece of fossil turtle and a name for the Kallokibotion synonymy list. In all, a bit of an anticlimax. How did our short paper end up with 20 authors? 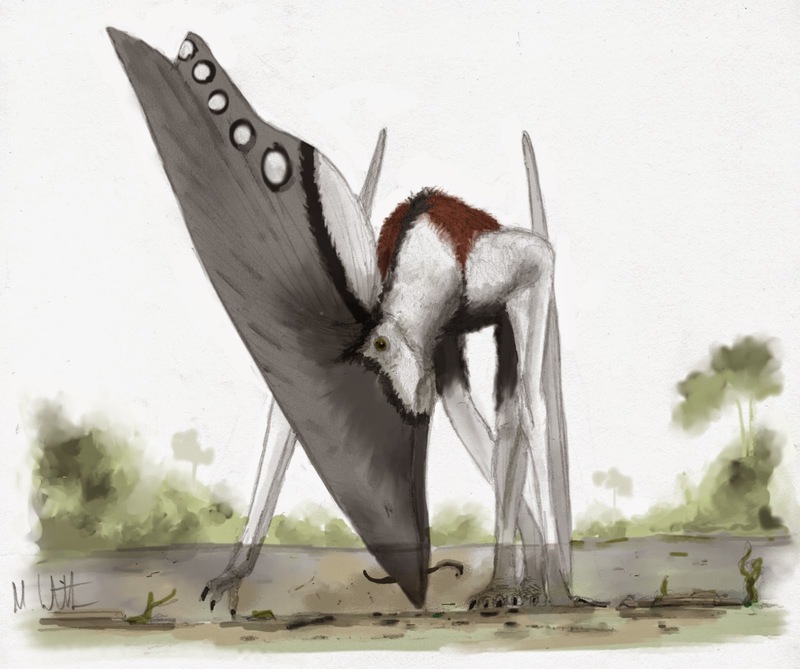 The response was started by experts in the terrestrial faunas of upper Cretaceous Romania, who asked me and the Natural History Museum’s Lorna Steel if we could contribute a few paragraphs targeting the flawed pterosaur identity of the specimen. While we were working, it emerged that pterosaur experts from Brazil were also planning a response. The editors of Gondwanan Research, who published Grellet-Tinner and Codrea (2014), understandably only wanted one response, so the two teams joined forces. By the time experts in turtles, Romanian fossils and pterosaurs were all on board, we ended up with a truly international background: the USA, UK, Brazil, Romania and France are all represented. A final note: this is not the first time thalassodromids have been pulled to the top of the Cretaceous. Kellner (2004) and Martill and Naish (2006) argued that a partial skull and mandible from the Maastrichtian Javelina Formation of Texas represented a thalassodromid based on perceived similarities with the thalassodromid Tupuxuara. While others have argued against this idea (the mandible and premaxillary morphology are more similar to those of azhdarchids - Lü et al. 2008; Witton 2013) - these claims have not been met with a sledgehammer response because the suggestions are not unreasonable. Sure, I don’t think the Javelina material in question is thalassodromid, but I can see why others might. ‘T. sebesensis’ has been swiftly rebutted by a crowd of experts because the underlying science is so clearly bogus that all concerned with pterosaur and Romanian palaeontology wanted it’s impact nipped in the bud. A response from Grellet-Tinner and Codrea will be published soon, so we'll see what they make of our rebuttal. To end on a high: there are exciting pterosaur remains coming out of Romania, and some of them are in the review/publication system already. Hopefully, we'll have some news on these out soon. Dyke, G. J., Vremir, M., Brusatte, S., Bever, G., Buffetaut, E., Chapman, S., Csiki-Sava, Z, Kellner, A. W. A., Martin, E, Naish, D, Norell, M, Ősi, A, Pinheiro, F. L., Prondvai, E, Rabi, M, Rodrigues, T., Steel, L., Tong, H, Vila Nova B. C. & Witton, M. (2014). Thalassodromeus sebesensis-a new name for an old turtle. Comment on" Thalassodromeus sebesensis, an out of place and out of time Gondwanan tapejarid pterosaur", Grellet-Tinner and Codrea. Gondwana Research. IN PRESS. Gaffney, E. S., & Meylan, P. A. (1992). The Transylvanian turtle, Kallokibotion, a primitive cryptodire of Cretaceous Age. American Museum novitates; no. 3040. Grellet-Tinner, G., & Codrea, V. A. (2014). Thalassodromeus sebesensis, an out of place and out of time Gondwanan tapejarid pterosaur. Gondwana Research. Kellner, A. W. A. (2004). New information on the Tapejaridae (Pterosauria, Pterodactyloidea) and discussion of the relationships of this clade. Ameghiniana, 41, 521-534. Lü, J., Unwin, D. M., Xu, L., & Zhang, X. (2008). A new azhdarchoid pterosaur from the Lower Cretaceous of China and its implications for pterosaur phylogeny and evolution. Naturwissenschaften, 95(9), 891-897. Martill, D. M., & Naish, D. (2006). Cranial crest development in the azhdarchoid pterosaur Tupuxuara, with a review of the genus and tapejarid monophyly. Palaeontology, 49(4), 925-941. Witton, M. P. (2009). A new species of Tupuxuara (Thalassodromidae, Azhdarchoidea) from the Lower Cretaceous Santana Formation of Brazil, with a note on the nomenclature of Thalassodromidae. Cretaceous Research, 30(5), 1293-1300.